Today we're taking a quick look at Toshiba's THNSNJ512GCSU, a 512GB SATA 6Gbps SSD from the company's HG6 lineup. The HG6 series is marketed towards a broad range of applications, from ultrabooks to data centers, and is available in 2.5-inch, mSATA, and M.2 form factor.s The lineup uses Toshiba A19nm Toggle 2.0 MLC NAND flash memory, which is rated for maximum read speeds of 534MB/s, maximum write speeds of 482MB/s and an MTBF of 1.5 million hours. The version I'm testing is the THNSNJ512GCSU, a 2.5" model with a thickness of 7mm. Unlike most of the solid state disks that are aimed at gamers and PC enthusiasts, this model from Toshiba looks very minimalistic. It's very thin and light-weight and has a metal enclosure. These disks are primarily intended for the OEM market but you can also find them in the retail channel. My test model arrived in a plain cardboard so I can't comment on the retail bundle. You can see some of the pink thermal pads peeking out through the holes at the back of the SSD. 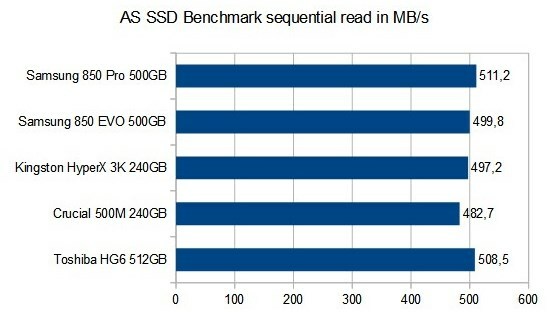 Inside the disk is Toshiba's own 19nm MLC NAND flash memory and their own SATA 6Gbps controller. These disks have a three-year warranty and promise an MTBF of 1.5 million hours. 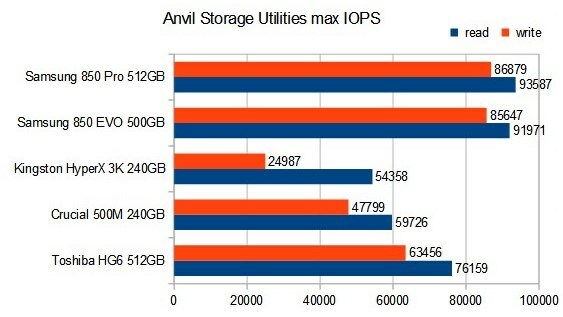 After formatting the 512GB model has a usable capacity of 476GB. Our first test is AS SSD Benchmark, this benchmark can be used to check the maximum sequential read and write speeds and 4k read/write performance with incompressible data. Next is CrystalDiskMark, we configure this test to write random data to check performance with incompressible data. 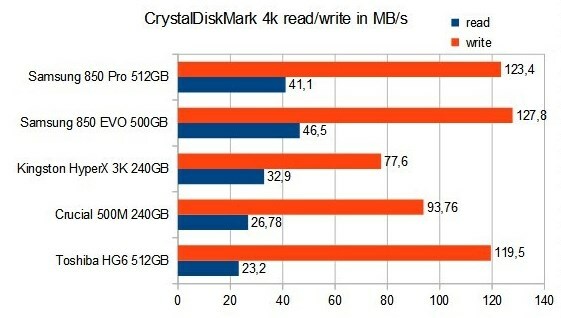 We provide the 4k read and write figures so you can evaluate how well the disk handles smaller file sizes. 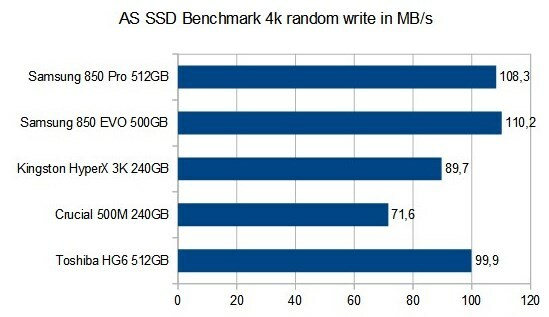 We configure this benchmark to write incompressible data in 4K block sizes to determine the IOPS of the disk. 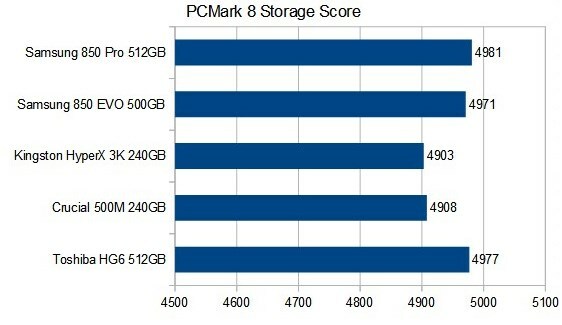 And for the final test, we check out the PCMark 8 storage score. Overall the performance of the Toshiba HG6 isn't too bad, it outshines the older generation SSDs but doesn't quite match the performance of newer disks like Samsung's 850 series. This is especially true in synthetic tests although in real world oriented tests the disk holds up itself very well. The chances of finding one of these disks in the wild is pretty rare though, Toshiba mainly ships its disks to OEMs and system integrators. 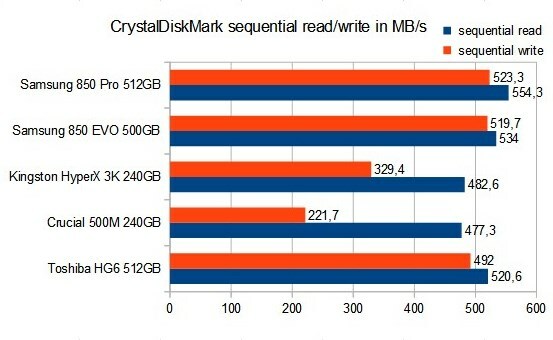 As such, the disk is hard to find in most markets and due to the limited availability, the price/performance is usually not that good compared to its competitors. This makes it hard to rate this disk as it's not really a direct-to-consumer product. 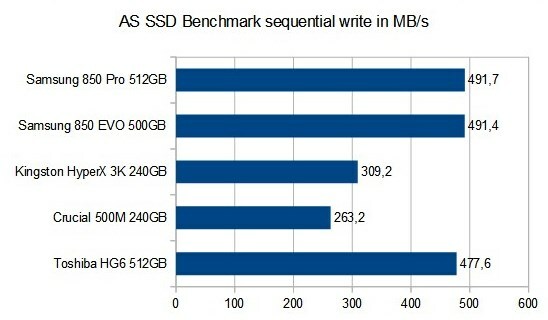 I give the Toshiba HG6 SSD series a 8/10.